#34 Rolls into Victory Lane at the Glen! WAKTINS GLEN, N.Y. [September 9, 2017] – Tony Buffomante secured his fourth TA2 class win of the 2017 season today at Watkins Glen International, emerging atop the 19-car TA2 field in 102-mile race around the 3.4-mile track that saw four different leaders and a restart with only five laps remaining. Buffomante, the 2016 TA2 champion, was joined on the podium by two other former champs— Gar Robinson, 2015, and Cameron Lawrence, 2014 and 2013—completing the podium. Buffomante, in the No. 34 Bestline Superior Lubricants Ford Mustang, began the race in seventh position but worked his way up to fourth by the start of the second lap before making his way into third by lap 12. Buffomante would overtake the No. 12 Speedlogix Dodge Challenger of pole sitter Jason Hart for second position on lap 17, settling into pursuit of race leader Shane Lewis, in the No. 72 Pura Vida Tequila/ 74 Ranch Resort Chevrolet Camaro. Buffomante’s pursuit would continue five more laps before the No. 72 of Lewis spun on the exit of turn one coming off the paint and rumble strips, giving Buffomante the lead and creating the first and only full-course caution of the race. Buffomante would hold the lead through the restart and remaining five laps, giving the win to Mike Cope Racing and stretching his podium streak to four consecutive races. The victory is the 11th of Buffomante’s TA2 career, tying him second all-time with Bob Stretch. Finishing second was points leader Gar Robinson, in the No. 74 Pura Vida Tequila/ 74 Ranch Resort Chevrolet Camaro, minimizing the distance closed by Buffomante in the championship battle between the two. The win marks three victories in four races for Buffomante—the only miss a second place finish at Road America—as the Series enters its final stages, a span during which Buffomante performed well last year. Like Buffomante, both Robinson and Cameron Lawrence, driver of the No. 19 Class Auto Chevrolet Camaro, drove from behind to secure their podium positions. Robinson recovered from eighth position after a spin of his own, charging from fourth to second over the last four laps while Lawrence drove back from eighth position to capture third with two laps remaining. The TA2 top five was completed by pole sitter Jason Hart who finished fourth and Tom Sheehan, in the No. 97 LTK Insulation Technologies Chevrolet Camaro, a career best TA2 finish for Hart and the best of the season for Sheehan. The top ten also included Harry Steenbakkers, Doug Peterson, Curt Vogt, Phil Lasco and Elias Anderson. Dillon Machavern, in the No. 24 Heritage Motorsports Ford Mustang, led laps 10 through 11 before the No. 24 retired due to suspension issues. For continuing his podium streak Buffomante was awarded the CoolShirt Systems Cool Move of the Race while the Damon Racing team of Tom Sheehan was awarded the Pitboxes.com Crew of the Race, and Crew Chief Jamie Abue received the TraqGear Crew Chief award. 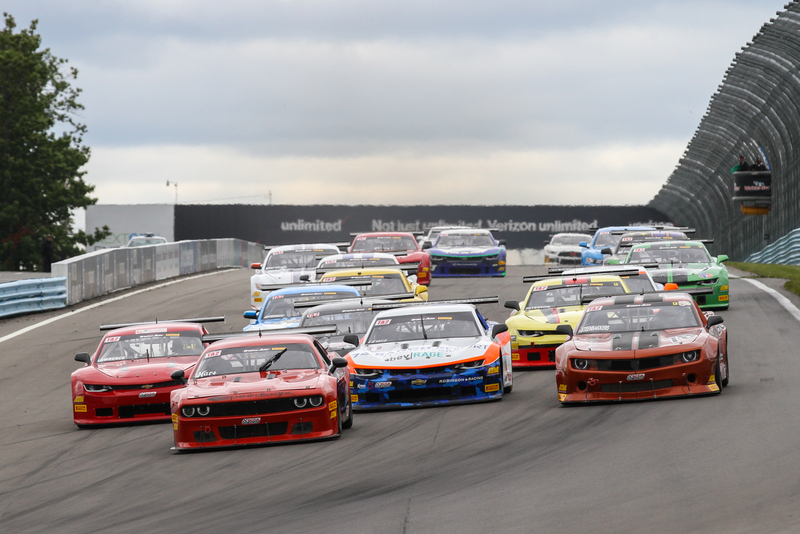 Trans Am’s TA, TA3 and TA4 classes will hold qualifying later this afternoon with sessions commencing at 5:15 PM ET in preparation for their multi-class 102-mile competition tomorrow, Sunday September 10, also at Watkins Glen. The Trans Am Series presented by Pirelli weekend at Watkins Glen is being held in conjunction with the Sportscar Vintage Racing Association and its US Vintage Grand Prix weekend.